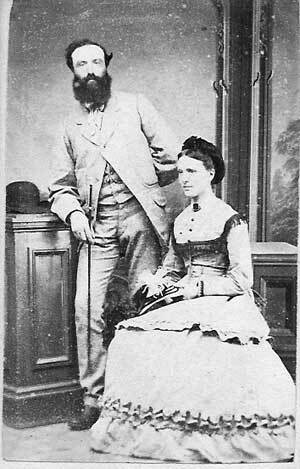 This is William Menary & Mary Menary - likely in the early 1870s. This is Mary Griffin in her mid-life. 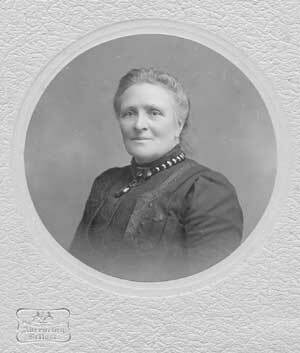 Mary Menary was born on 5 November 1872. Mary JACKSON’s first husband William MENARY is possibly the MENARY who owned 80 acres at Maghery, Milford (SOURCE: Co. Armagh Landowners circa 1870s). The townland, Magherarville is 169 acres in the Civil Parish of Lisnadill, and very close (not quite bordering) on the townland of Killynure. We don't know if Mary JACKSON’s second husband, Frederick Richard GRIFFIN is any relation of the Phil GRIFFIN who married Sarah JACKSON, likely in the late 1700s. Nor do we know if there is a link to the GRIFFINs of Griffinville Quebec, Canada (although I wouldn't rule this out). We do know that he was a twin of John Gilmore Griffin, the father of the well known writer Frederick GRIFFIN of Toronto, both of them sons of Philip George GRIFFIN and MArgaret GILMORE. The link was found in a love letter written by Frederick prior to his marriage to Mary MENARY (see:1886 GRIFFIN to MENARY . The only other source at this time relating to GRIFFIN and JACKSON is to be found in an excerpt from article by Mary Cuminsky, “Sir Thomas Jackson”. 1990 Journal of the Creggan Local History Society. Her source was: Mary Ann Griffin (nee Hearty). The marriage of Mary MENARY to James “Jemmie” WRIGHT is the third intermarriage of WRIGHT into the extended JACKSON/BROWN tree. David JACKSON & Margaret Louisa WRIGHT, Thompson BROWN & Martha WRIGHT. There is also the mention of WRIGHT & HORNBY in Hong Kong where Andrew Hugh Gilmore JACKSON – younger brother of Jeannie MOORHEAD - worked in 1916 as well as the R.T. WRIGHT who worked with Sir Thomas JACKSON in Hong Kong.